Today is the third session of Mubarak’s trial , despite it will not be aired on TV yet there is a lot of action to be followed there. We do not know if the session has started or not or if Mubarak arrived in court whether on stretcher or a wheel chair or whether his sons are going to wear new white training suits or not but we know that today the witnesses will speak and the snipers topic will be brought up. The Kuwaiti delegation was not permitted to defend Mubarak , already they have not read the case or know anything about case. Clashes between the Mubarak supporters from one side and the families of the martyrs from another side and the families of the martyrs and the CSF from another side. There is a huge presence for security forces unlike other time yet it is not separating between the Mubarak’s supporters and the families of the martyrs but rather chasing the families of the martyrs and the media !! It started when the families of the martyrs tried to cross the barricades and to attend the session. 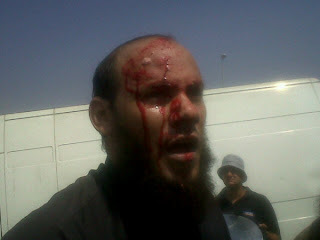 The journalists as usual are being attacked by both Mubarak supporters and the CSF. There are stones hurled from every side and as a result there are wounded from the Mubarak’s opponents as well as the security forces. The injured number is between 20 to tens !! Here is a photo from Farah Saafan from Daily News Egypt. Allegedly Alaa and Gamal Mubarak have reached to the court. No news about Mubarak. Lawyer Amir Salam will present to the court the 50 GB footage he claims to have incriminating Mubarak regime. 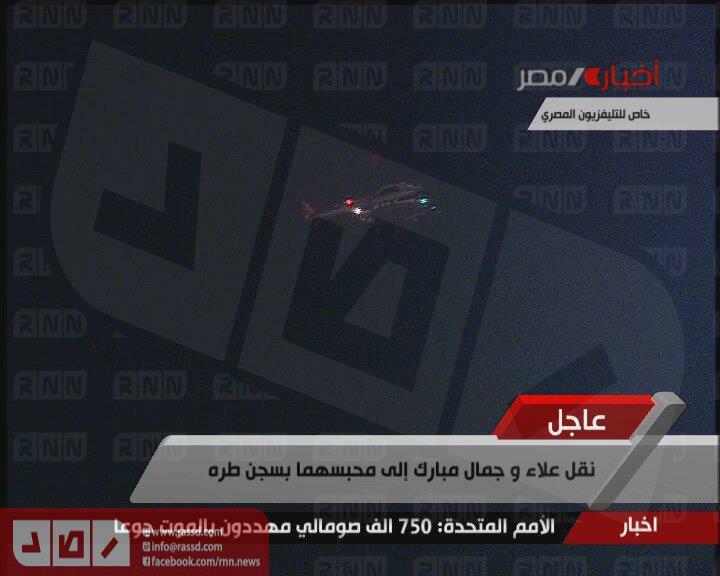 Here is a video showing the clashes from Al Jazeera Mubshar Misr. 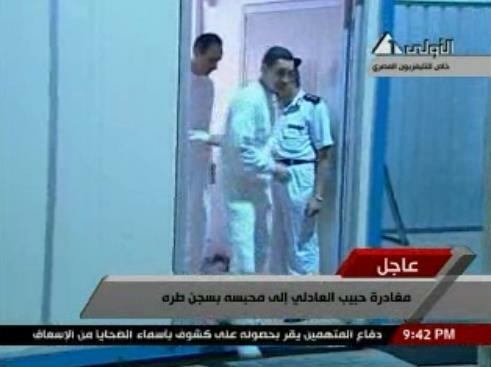 Here is the photo of Mubarak entering the court room over the stretcher as usual wearing a grey training suite. Here is a video showing his entrance. Al Arabiya News Network claims that Gamal and Alaa Mubarak entered the court room while they were handcuffed. The Clashes between the security forces and the opponents of Mubarak including the families of the martyrs are back again. 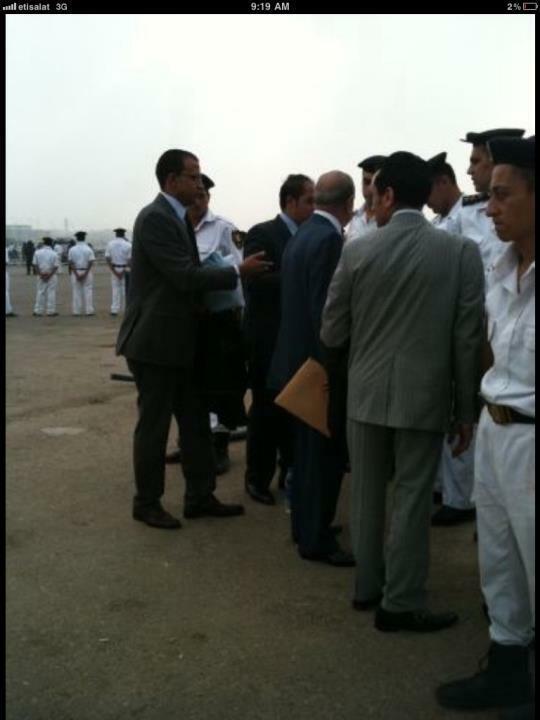 It started once again when the Mubarak's opponents got closer to the Mubarak's supporters. Only two families from the martyrs' families were granted permits to attend the trial. Recess time Judge Ahmed Rafeat calls for recess and the lawyers leave the dock. It is recess time indeed. 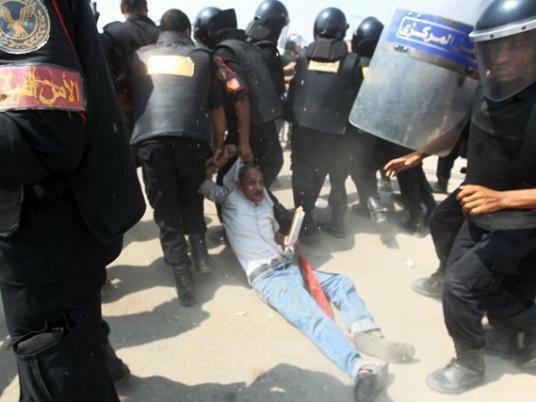 Youm 7 published a terrible photo allegedly from today's clashes outside the court. There is on going circus literally in the court room during the recess. According to Al Jazeera channel the defense lawyers and the civil rights claim lawyers had a violent fight with shoes where 6 have been injured !! According to other news sources the Judge order the army to enter the court room to restore order. Allegedly the fight started when a pro-Mubarak photo banner suddenly appeared from no where in the court room. "Do not ask on how did this banner enter?" Things began to turn from ugly to uglier when allegedly one of the civil rights claims lawyer took the banner and set it on fire !!!!! "Do not even ask or wonder !!" Human rights activist and lawyer Gamal Eid says that the security let this banner deliberately. Gamal Eid who is tweeting from inside the court room said that the army officers entered the court room to find a small protest by the civil rights claims lawyers "The people want to execute the dictator"
Farid El Deeb is allegedly seen while leaving the court room. 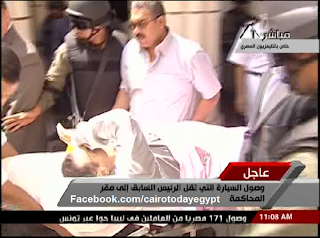 The Mubarak supporters have allegedly left by the help of the security forces in ambulances !! Here is a photo gallery from AP, Reuters and Getty shows you the battles outside the courthouse or rather the Police academy. The session has started , the judge is confused according to Gamal Eid. The first witness is going to speak. The first witness is police general Hussein Moussa , the head of the communications department in the ministry of interior. Gamal Eid is tweeting his testimony !!!!!!! Not less than 15 protesters from Anti-Mubarak supporters including members of the martyrs families have been detained by the security forces. 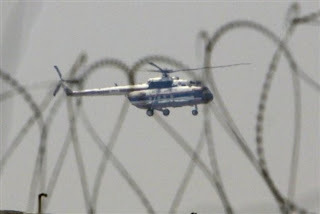 CNN's reporter in Egypt Mohamed Fadel did an interesting report about Mubarak's sons. I do not think I should write down the testimony of general Moussa or not because I feel it is wrong yet my media instinct tells me not to do it. Ok I am going to do because it is important but please wait coz they are extremely important. There is a recess now , the judge has suspended the session after a debate with the civil rights claims lawyers. Supposedly after the recess the second witness will be called. It is still recess. It is quiet somehow outside the police academy. The session has been resumed once again. The judge suspends the session again after another debate with the civil rights claims lawyers again for the third time. The case has been adjourned to Wednesday September 7,2011 to hear the testimonies of the 5th,6th and 7th witnesses. The Mubaraks have left police academy late night. Gamal and Alaa Mubarak not to mention El Adly "officially convicted" are not handcuffed. The public prosecution is still investigating with the detainees from anti-Mubarak protesters that stood with the families of the martyrs including Dr. Amr Mousa , the member of April 6th Movement "Democratic front"
TV host and political activist Abdel Rahman Ezz was attacked and hit by security forces from more than 6 hours ago when he tried to defend Mousa. Ezz is an also member of April 6th Movement "Democratic front"
Here is the helicopter transferring Hosni Mubarak back to the international medical center. Now I would like to share this photo with the civilized world showing our CSF while dragging the father of 16 years old martyr Mohamed Soliman. If I am not mistaken Mohamed Soliman was originally from Alexandria and his father was a 1973 war navy veteran !! Egyptian journalist Rania El Malky who left the court at 7 PM after being exhausted said that she saw Alaa , Gamal and El Adly in cage while Mubarak was not seen clearly. 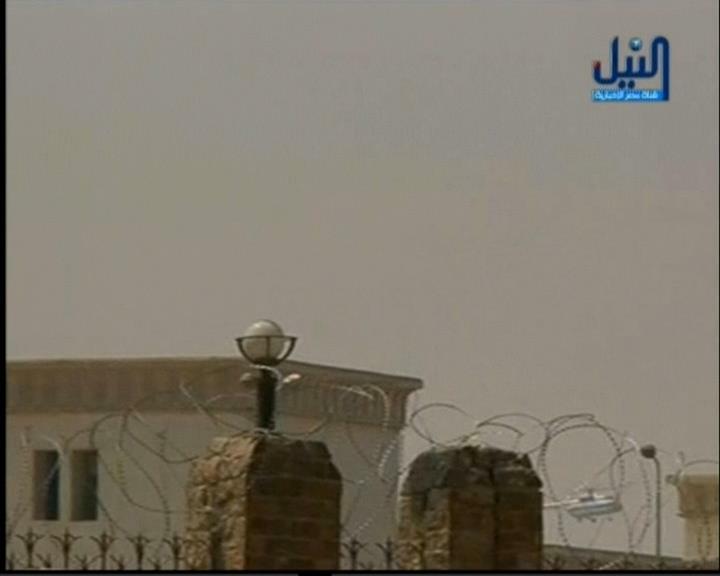 There were CSF conscripts wearing civilian clothes seated between the rest of the public and the cage. "I know about them since the first session"
thank you Z for the updates. looking at the photo and the the attitude of the police it seems nothing change in Egypt and sad but it is the truth. 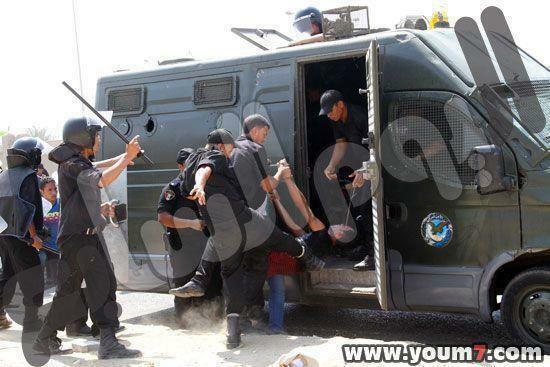 look at the photo on how the police kick the guy they arrested. people are still treated like animal without respect! the anti-mubarak are not the true criminal! the police should arrest those mubarak supporters who are there to create chaos and are paid to be there unlike the martyr families who wants justice for their loved ones! Egyptians need to wake up and dont let this mubarak croonies hijack the revolution! as usual mubarak dont have back bone to sit on wheel chair and still coming to the court house on hospital bed and he and his lawyers are all good actors to get people sympathy for him! Judge Refaat need to be strict with his court room! he should make sure his court are not souk where mubarak supporters or lawyers can do anything they think fit for king mubarak! there should not be any banners of mubarak or even mobile inside the court room! the police and Court need to remember mubarak is a deposed president not president anymore to be treated like king! this 10 lawyers from Kuwaits should be barred from entering the court coz their motives are to create chaos and destroyed the case! I think mubarak have more than enough lawyers to defend him and his sons! Hi Zeinobia and Egyptian Chronicles readers, have you heard about this? EL NASCHIE RUNS FOR EGYPT PRESIDENCY! !